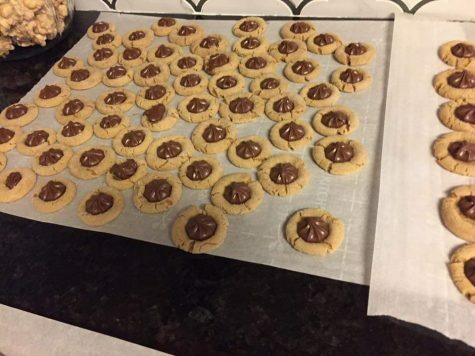 Every holiday season my family makes these cookies but usually we triple the recipe. My mom would let me put the ingredients into the mixer and after she shaped them into a ball she would let me roll them in the sugar. These cookies are best eaten warm in pajamas with hot chocolate. Making these cookies with friend and family is a great way to create memories and celebrate the holiday season. 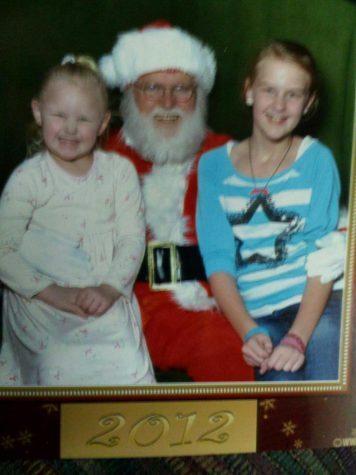 Grace circa 2012 with her little sister and Santa. Sift the flour and baking soda into a bowl and in a separate bowl cream butter, peanut butter, sugar, and brown sugar, vanilla and the egg. Add the dry mixture to the wet mixture. Mix thoroughly. The end result of Grace’s best peanut butter cookies. Shape dough into a ball and gently roll around in sugar and then add to a baking tray. Bake for 8 minutes. Remove the tray and place one chocolate star in the center of each cookie until the cookie looks lightly cracked. Bake for another 2-5 minutes until chocolate is slightly melted.